The influence of sample temperature on the performance of a near infrared (NIR) calibration equation was evaluated and then the development of a calibration equation, which can compensate for a variation of sample temperature, was examined. The results obtained are as follows. (i) The calibration equations developed using samples at constant temperature were not stable in predicting when the sample temperature varied. 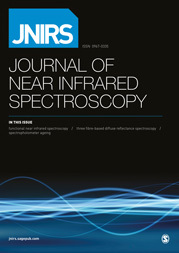 (ii) NIR spectra were affected by sample temperature; as sample temperature increased, absorption became stronger at 841 and 966 nm. A similar phenomenon is exhibited by water. (iii) Water absorption is easily influenced by a variation in temperature, therefore it was considered that water was an important factor causing a bias when the sample temperature varied. (iv) The calibration equations developed using samples which had a temperature range from 21 to 31°C, showed a high accuracy in prediction, even if the sample temperature changed in that range. In consequence, it was concluded that a calibration equation with temperature compensation could be developed using a combined calibration sample set which covered a variation in temperature of the samples in the future.